The purple patterned wrapper in the foreground is from a Christmas present I received in 2008. The white tissue wrapper in the background came from a clothing packaging. 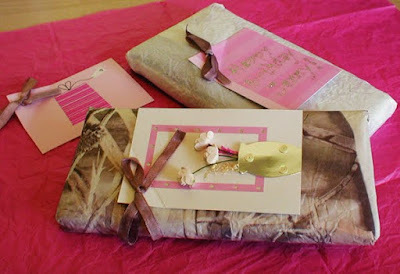 The dark pink tissue wrapper underneath is from another gift I received some years ago (which will be used for wrapping the other present) . The gift cards are cut out from old birthday cards. The ribbons are taken from an old top I dismantled. Nothing is new here except for what's wrapped inside, which is the most important thing. But I think they still look quite sweet anyway.